The waitress cheerfully supplied a pen and napkins were spilling out of our tables’ chrome dispenser. 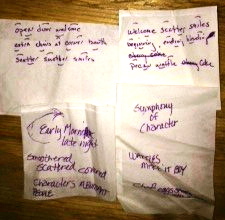 Hence the wild rumpus began and after a flurry of ideas we came up with the above offerings. Any guesses as to where we were? I love Waffle House and haiku, so this post was a hit with me! Makes me want a pecan waffle. Waffle House because the Dwarf House is closed on Sundays. I want to learn how to flip those eggs!